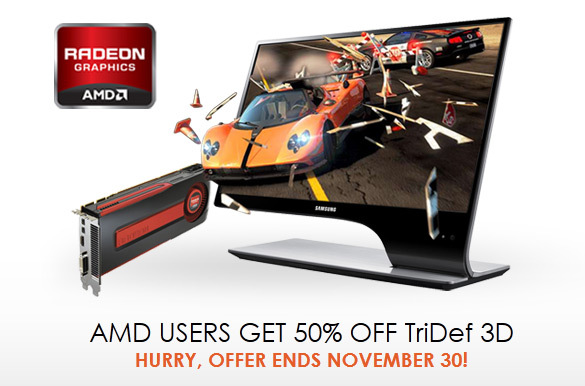 If you have an AMD-based video card that has support for the AMD HD3D Technology (Radeon HD 5000 series or newer) you can take advantage of the promotion that DDD is currently running for their TriDef 3D software and get a license for half the normal retail price. With the help of the TriDef 3D software you can convert games into stereoscopic 3D format for playing on compatible 3D-capable monitors or 3D HDTV sets, as well as play 3D photos and 3D videos on your 3D-cabled PC. Have in mind that this discount will be valid until the end of this month (November 30th), so you should take advantage of that offer now and not wait for the last moment and possible miss your chance. What you should be well aware of however is that by getting the discounted license for the TriDef 3D for AMD HD3D software you will be able to run it only on compatible AMD graphics, so if you replace your graphics card with an Nvidia-based one at a later time you will not be able to use the software on it! The TriDef 3D software has a 14-day trial version available that you may download and try before you decide if you should buy a license for the software. If you were hoping that Samsung may get back to the Nvidia camp for its 3D-capable PC monitors after being the company that released the first 3D Vision-ready display and then moved to the TriDef 3D solution for providing stereoscopic 3D support on PC, you’ll might be disappointed by the news that Samsung has just renewed its license agreement to continue using DDD’s TriDef 3D software package. Samsung Electronics will continue to bundle DDD’s TriDef 3D solutions with Samsung’s lineup of 3D monitors probably for another two years, though the length of the agreement extension hasn’t been mentioned. The previous license agreement between the two companies was for a period of 2 years and was announced on 14th April, 2011 in time for the release of the Samsung SA/TA750 and SA/TA950 series of 3D monitors. It is interesting to see if Samsung will be releasing new models soon considering the company is renewing the license agreement. Have in mind that Samsung has also licensed DDD’s 3D technology in it’s 3D HDTV products that allow Samsung to perform automatic 2D to 3D video conversion. The five-year license agreement was announced in February 2008 and involved DDD and Samsung collaborating to implement DDD’s TriDef real-time 2D to 3D conversion and 3D image processing architecture in the embedded 3D processing chip developed by Samsung for their next generation 3D HDTVs. In 2012 approximately 15 million units with DDD’s TriDef 2D to 3D conversion technology were shipped, up 67% from 2011. This brings the cumulative number of consumer devices shipped with TriDef 3D technology to more than 26 million units worldwide (this number covers all devices and not only 3D HDTVs) at the end of December 2012. Chris Yewdall, Chief Executive of DDD has also revealed that over three million copies of the TriDef 3D software package has been shipped to date. That number probably includes the OEM versions as apart Samsung Electronics, DDD also has licensed the TriDef 3D software to AOC, HP, Lenovo, LG, Sony, Philips, Viewsonic and others though besides form Samsung most other 3D displays use passive 3D technology. At the Consumer Electronics Show in Las Vegas in January 2013, DDD debuted a number of new 3D solutions aimed at the growing market for 3D mobile devices – including smartphones, tablets and personal media players. DDD expects mobile shipments to return to growth in 2013 on the back of emerging demand for tablet PCs with 3D functionality. DDD’s TriDef 3D software is available in more than 37 languages and allows over 750 of the latest PC games to be played in stereoscopic 3D “off the shelf”, even in cases where the game has not been specifically developed to be played in stereo 3D mode. The TriDef 3D game conversion engine is compatible with DirectX 9, 10 and 11 games and is compatible with PC graphics processors from AMD, NVIDIA and Intel’s 2nd Gen Core processors. In addition to a wide variety of PC games, TriDef 3D automatically converts PC video and photo files from 2D to 3D and is compatible with the growing library of original 3D content available from DDD’s Yabazam! 3D content portal. Following the release of the TriDef 3D Ignition 3.5 Beta 1 last month, now comes a new official release in the form of TriDef 3D 5.2. The new official version pretty much includes what the Beta release of the Ignition software introduced with a few more updates. The DDD TriDef 3D software package enables the viewing of movies, photos and games in stereoscopic 3D mode on compatible hardware, it is one of the two middle-ware solutions (the other being the iZ3D driver) used for ensuring stereo 3D support on AMD hardware (apart from the few games that support natively the AMD HD3D technology), but the software is also compatible with Nvidia-based video cards as well.